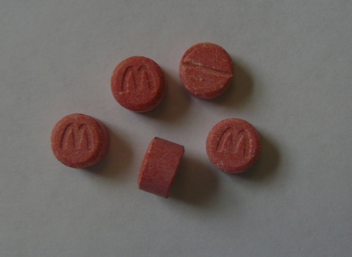 Deadly ecstasy pills sporting the Golden Arches MacDonald’s logo have been seized in Scotland, all containing para-methoxy-amphetamine (PMA) – a strong psychedelic and killer ecstasy substitute. The price of ecstasy pills is on the rise and there is increasing belief that the quantity of MDMA in pills is increasing, but this deadly seizure reminds us that pills vary widely in composition – and there are pills out there you do not want to try. If only ecstasy pills were as consistent as a Big Mac! PMA closely related to PMMA, has been connected to a number of deaths over the last decade in Canada, the US, Europe and Australia. While PMA was initially thought to be a by-product created in the production of MDMA, this is unlikely given the different precursors that each requires for their production. A delayed onset of effect (often more than 2 hours) can lead to inadvertent overdosing – thinking ‘these pills are crap, better take another one of two and see if we get something’. However it can lead to muscle spasms, burred vision, overheating (hyperthermia), and increases in pulse and blood pressure. Nausea and vomiting can lead to loss of potassium leading to hypokalemia (low potassium levels) which combined with hyperthermia can lead to irregular heart rhythms, seizures and death – see more on taking new pills here. So if someone offers you a pill with the Macca’s logo on it – believe use you won’t be ‘lovin it’.